A new level of hardware and software IP integration is needed for true power optimization. Both Intel and Microsoft took the stage at the recent Intel Developer Forum in San Francisco, CA. Their goal was to highlight a new level of hardware and software integration, which aims to optimize energy usage. Not surprisingly, battery life in today’s CPU-based systems is dependent upon both hardware and software factors. Hardware usage determines the extent of power consumption. Software dictates when the hardware is active and idle, which in turn decides when and for how long the system can make use of low-power states. (prior to Windows ) could be idle for at most 15.6 ms. Similar hygienic OS changes have been introduced in the network, storage, and input/output hardware subsystems. Software – in all of its myriad forms – is now one of the chief causes of increased power consumption. Paying attention to “hygiene” is but one small way to reduce this consumption. Still, every bit helps. Virtual Reality for Chip Design? As chip design moves into the realm of three-dimensional transistor structures and even MEMS, virtual-reality simulators may prove a necessity for both architects and educators. They say that travel broadens the mind. That has certainly been the case with my recent visits to some of the leading semiconductor and electronics tool companies and research organizations in Europe, including ASML, Dassault Systemes, and Imec. Each of these entities offers technologies that are pertinent to the IP community, which I’ll cover in the coming weeks. For now, let me whet your interest with a short video clip from Dassault Systemes’s virtual-reality development and deployment system, which is called 3DVIA. Think of it as a super-fast and detailed simulation program expanded into three dimensions. John Blyler explores the large-scale visualization of an industrial chemical facility, which was developed using Dassault Systemes’s 3DVIA Virtools technology. 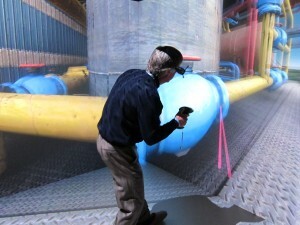 A handheld control enables the user to travel throughout the virtual world. Such a system might seem like overkill for the world of chip design. After all, EDA-IP tool providers already offer sophisticated modeling and simulation tools for every aspect of chip design – especially in virtual software through hardware-based prototyping. Still, as the chip community moves into an era of 3D structures, through-silicon vias (TSVs), stacked dye, and microelectromechanical (MEMS) devices, the potential benefits of virtual-reality (VR) simulation become more tangible. Such VR simulations could be used to visualize the effects of evolving transistor structures, such as fin-Fetts, or to enhance the accuracy of thermal flows around stacked die. Plus, 3D and virtual-reality models have proven invaluable as teaching aids to both novice and seasoned designers across a wide range of engineering disciplines. Translating the complex interactions of today’s systems-on-a-chip (SoCs) into a virtual-reality program would require serious processing and graphics hardware. Each dimensional display in the 3DVIA system requires at least one server and GPU cluster. Fortunately, advances in server and GPU technology make these systems available on the commercial market. Like the EDA industry, chip design must become part of a larger system-design process – both in terms of disciplines (EE-CS-ME) and domains (chips-boards-modules). The move toward a system view necessitates additional simulation and modeling tools. Virtual reality may have a strong play in this evolving world. You are currently browsing the JB's Circuit blog archives for October, 2012.